Apparently the following information was released back in October but I had completely missed it and did not receive a press release about it (until today, January 15, 2018). As I previously posted, the Rotary Club of Houston announced that they would not be giving out the 48th annual Lombardi Award despite having presented the previous 47 awards. You can read the Rotary Club of Houston’s press release here on OnePointSafety.com, or on their site at LombardiAward.org. Today I received a press release in my email announcing that the award would be given out on January 27, 2018. However, it will now be awarded by the Lombardi Foundation (click here to read the October 2017 press release). A few notable differences between the October 2017 release, and the release I received via email today, are: (1) the location of the event will be held at Lone Star College (in Houston) as opposed to the Hobby Center, and (2) the second release contains a list of award nominees. Up to seven finalists from this list will be selected by the award voters this week and announced next Monday, Jan. 22. Four of the finalists will be invited to the Lombardi Honors presentation that will include several other awards being recognized, including the Lombardi Coach of the Year. If I find a copy of the January 2018 release online, I will post it here later. I have been a college football award voter since at least 2009 (and possibly as far back as 2006 from what I can remember, although at this time, I can’t find proof that I voted in anything earlier than 2009). I love the individual college football awards; I have always taken pride in my status as a voter and always give my votes serious consideration. In 2011, I was honored to be selected as a voter in the Lombardi Award which was given out by the Rotary Club of Houston. As you probably already know, the Lombardi Award was historically given to the best college football lineman or linebacker, however, before the 2016 season, the award was changed and any college football player was eligible for consideration. However, a couple of weeks ago I was notified that the Rotary Lombardi Award will not be given out this 2017 season for reasons that are not entirely clear. The purpose of this post is not to speculate as to the reasons, but to simply inform readers of this decision. As far as I know, in July of 2017 the award was still scheduled to be awarded after the 2017 season, as a pre-season watch list was announced on July 31, 2017. HOUSTON, Texas (Sept. 29, 2017) – Representatives of the Lombardi family have elected to end the historic and long-standing relationship with the Rotary Club of Houston. Consequently, the Rotary Club of Houston will not present the 48th Annual Rotary Lombardi Award for the 2017-2018 College Football Season as previously announced. The Club is very proud of its history in promoting, managing and presenting the Rotary Lombardi Award for 47 years. The Rotary Club of Houston is a non-profit volunteer organization that established the Rotary Lombardi Award to honor legendary coach Vince Lombardi and to raise funds to fight the deadly disease that claimed his life—Cancer. Since 1970, the Rotary Club of Houston has presented this prestigious award to a talented college football player who not only demonstrates outstanding athletic performance and skill, but exemplifies the type of discipline, courage and wisdom that define Coach Lombardi’s exceptional brand of leadership. Proceeds from the Rotary Lombardi Award have benefitted three designated charities—the American Cancer Society, M.D. Anderson Cancer Center, and Texas Children’s Hospital Cancer Center. “The Rotary Club of Houston applauds the numerous volunteers who have provided countless hours of service to support the mission of the Rotary Lombardi Award. Our members remain committed to the Rotary motto of ‘Service Above Self’ and will continue to raise funds and awareness to battle Cancer,” commented Rick Olsen, President of the Rotary Club of Houston for the 2017-2018 calendar year. The Rotary Club of Houston, founded in 1912, is the oldest and largest Rotary club in the greater Houston area. As a charter representative of Rotary International, a worldwide service organization with over 1.2 million members in more than 200 countries, the Rotary Club of Houston continues to provide assistance to various local and global community service campaigns. Notwithstanding Rotary’s international pledge to eradicate Polio, the Rotary Club of Houston sponsors several programs that address literacy, child welfare, veteran assistance, and public health. The Rotary Club of Houston is also credited with helping to establish Goodwill Industries and Little League Baseball in Houston, and actively participated in scholarship programs sponsored by the Houston Endowment and Houston Livestock Show and Rodeo. For more information, please visit www.rotaryhouston.org. I am not sure if, or when, the Lombardi Award will ever be back. 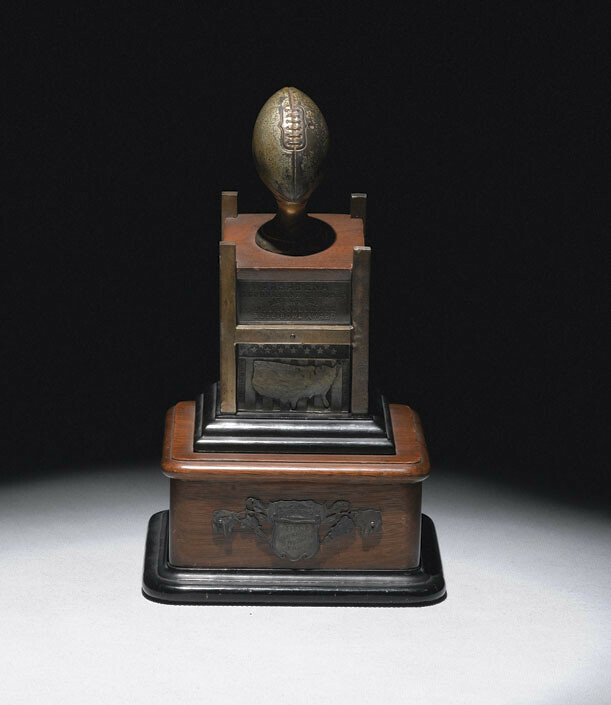 However, my hope is that it returns soon, as it is one of the great college football awards. With as much as I enjoy college football trophies, I can’t believe I didn’t think of this business idea before now. *Edit/Update: A better title for this post would be “Duke Coach’s 1942 Rose Bowl Trophy Found….In Trash,” as it was apparently a trophy that was given to one of Duke’s coaches, and not the team trophy that was given to Oregon State (winners of the 1942 Rose Bowl). However, after seeing how most schools treat their football trophies and artifacts I am not shocked by this news at all. Even I have found college football trophies in the trash. Discovering a Rose Bowl trophy is one thing. But coming across a 1942 Rose Bowl trophy — a relic from the only time “The Granddaddy of Them All” wasn’t played in Pasadena, Calif. — is something different altogether. But according to a report by ABC 11 news in Raleigh, N.C., that’s exactly what happened to one lucky man. The junk collector — who wished to remain anonymous — stumbled upon the piece of college football history four months ago while sifting through trash. The 1942 Rose Bowl between Duke and Oregon State was moved to Durham, N.C. due to a government ban on all large public gatherings on the West Coast of the United States in the wake of the Pearl Harbor attack. The Beavers beat the Blue Devils 20-16 at Duke’s home stadium in front of 56,000 fans (some of which sat on borrowed bleachers from nearby University of North Carolina in Chapel Hill). Even coaches on the losing side received hardware. The recovered item appears to have been originally awarded to then-Blue Devils backfield coach Eddie Cameron — the same Eddie Cameron who has an Indoor Stadium named after him. The man plans to let Duke have the first chance to buy the trophy. After that, he says it will go to the highest bidder.